We just posted some new items to the NANFA website. First are the custom embroidered hats featuring the NANFA logo. I designed these for the Nevada convention but in addition to deserts they are appropiate for swamps, backwaters and rivers while seining or dipnetting. They are a Fahrenheit 682 style nylon cap with an ear and neck protective flap. Made of quick dry fabric and a nylon back strap with a closure buckle for adjustments. Keep the sun and bugs off your neck. A hidden Mesh insert, on each side, allows breath-ability. Two button holes, located on the sides of the cap, can hold sunglasses. Available in 2 colors, stone or dark olive. These are well made and were high quality embroidered by one of our members. I also have printed a new batch of NANFA logos. These are offered in packages of 5 with each logo representing a different native fish and each illustrated by different artists, most who are NANFA members. The American Flagfish by Bart Gelesh, Mountain Redbelly Dace by K. Merry ( Lance's Father ), Arkansas Saddled Darter by Dave Neely, Carolina Pygmy Sunfish by a still unknown female artist and finally the Rainbow Darter by Joe Tomelleri. All but one of the illustrations were used on past convention shirts and the Mountain Redbelly Dace will be offered on the soon to be available Virginia shirts. All proceeds go to NANFA's Good Works. Edited by Casper, 07 March 2011 - 01:16 PM. Buying one of those hats right now... also registering for the convention... and buying the 2011 T-shirt! I love those decals...would look good on my tacklebox and fish bucket. Will 2011 t-shirts be sold at the convention or do they need to be ordered online? Edited by jblaylock, 08 March 2011 - 08:18 AM. To ensure you get the proper size, I would order them when they become available. They will be sold at the convention as well. 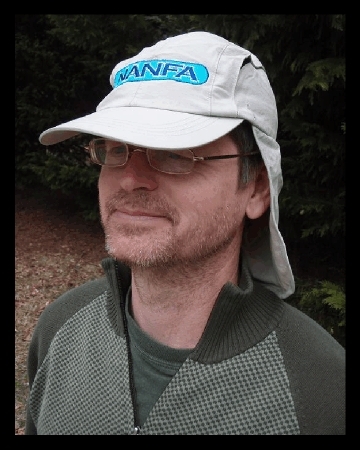 That's our Mark Binkley, unshaven after a week on the road modeling the NANFA hat. Thinking now i should have had him posing with his Perfect Dipnet. Though i have the Virginia t-shirt designed with Lance and his Father's lead, they are not quite ready to release. We are refining the printing technique and still awaiting the test print proof to insure the colors and quality are accurate. However, the decals and hats and other shirts are available now. If one does not want to use PayPal then they could send me a check directly, made out to NANFA. Whatever i can stuff into a box is only $5. for shipping. Cards, shirts, decals, hats, whatever. Just figure up the price and add $5. I really like how both the hats and the NANFA decals turned out. I tweaked the colors to perfection. Awesome stuff, Casper! That sticker packet is most impressive. There is no amount of thanks I can provide to adequately praise all of the work you guys do for free! It has been taken for granted and that is unfortunate. Hats off to you, Lance, and all the artists that have contributed their work. Thank you Blake. I do believe in NANFA and much enjoy the wonders of experiencing our Native Fish. So much to see, i am continually suprised with behavior, spawning activities and beautiful habitats. Clear water on a blue skied day in the right spot is bliss. Lush vegetation, clean substrate and light rippling down. I tell you another big part is meeting people from all over the country who share this wonder. Streamside camping and snorkeling with those folks is a treasure, folks coming from all walks of life but each a yearning naturalist. NANFA has really opened up a world of discovery for me in many aspects. I think we can all contribute in some way, sharing our various skills and i urge everyone to do so. I hope to see lots of folks in Virginia. Drew is working hard to prepare the way. Edited by Casper, 08 March 2011 - 01:12 PM. Having seen the decals already in person, I'd like to say they look phenomenal. Casper has done an amazing job on these once again. First Batch of Hats and Decals going out today. Cool, so my hat may be here for the Bioblitz... so I can represent NANFA and keep my neck from getting red! I sent the 2nd batch out yesterday. Im sure some of you are with hat and drive decaled vehicles now. Are they as you expected? Yes and more... Unfortunately I forgot to get a photograph of DD and me in our chapeaux nouveau... very spiffy! I am a little curious, are there logos that can be added to backpacks and life jackets and stuff? I would like some to att to my backpacks I use when sampling/collecting and to possibly add some to my lifejackets in my boat. I would be afraid the current decals would just peel off the jackets and backpack. NVCichlids... No you are talking about a "cloth embroidered patch" which does not exist. Expensive to produce in small quanities. I picked up the NANFA Virginia Convention shirts today. I'll have to pick mine up when I get there. Reserve one large please. Thanks! I hope you will be bringing some shirts to the convention. I'm in South Carolina until the convention and I won't get home to pick up a shirt if I order it now. Or I could order it now and pick it up at the convention. Which ever is easier for you. Im mailing out the 2nd batch of shirts this Friday the 13th and then bringing the rest to the convention, along with other shirts, hats, etc. Be best to get them at the registration desk as soon as possible though. I look forward to seeing you again Harry, along with everyone else. Perhaps you should consider doing the canoe trip with us on Sunday. Good I'll grab a shirt on Thursday when I get there. I'm looking forward seeing some old faces again, since I have not been able to attend a convention since North Carolina. I'll need to think about the canoe trip.